ePublishing Knowledge BaseePublishing Knowledge BaseePublishing Knowledge Base Creating Pages & Site NavigationHow do I create a landing page? The Page Manager Tool also allows you to build pages where you may embed code from third-parties or iframes. 1. 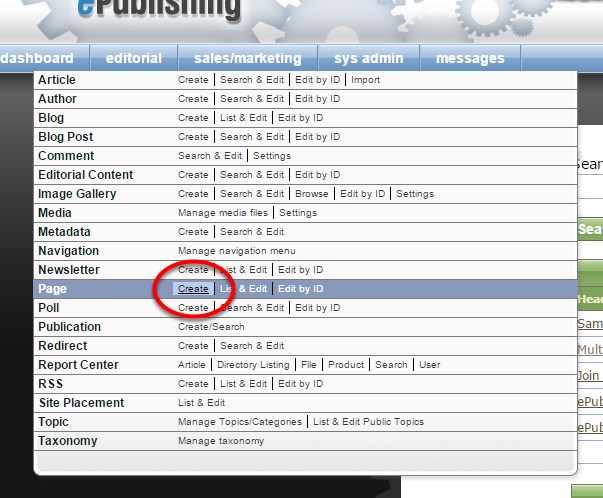 To access the Page Manager Tool, click on Create next to Page under Editorial on your dashboard. You may also access previously created Pages by clicking List & Edit or Edit by ID. 2. When the Page Manager opens, add a URL and a headline, if desired. Zoom: When the Page Manager opens, add a URL and a headline, if desired. Consider SEO when drafting your URL. 3. Using html or the WYSIWYG editor, add your page content in the Body section. This is required. Zoom: Using html or the WYSIWYG editor, add your page content in the Body section. This is required. For tips on how to format your content using the WYSIWYG: How do I format content? 4. 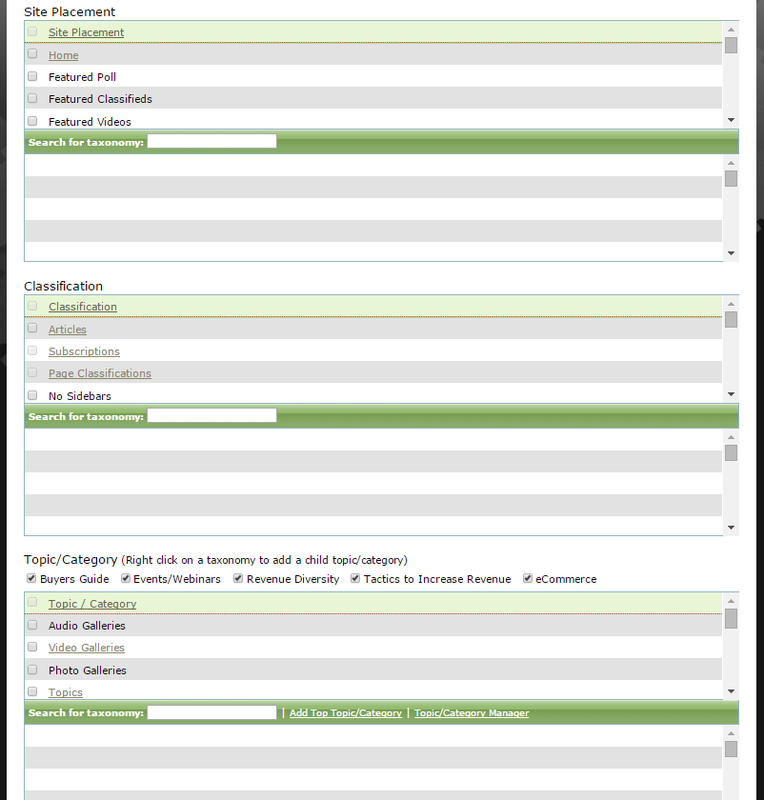 Categorize your page using the Site Placement, Classification and Topic/Category taxonomy lists. This will be unique to each website. Generally, pages created in the Page Manager Tool do not use the Site Placement taxonomy. Depending on how your website is designed, the Classification taxonomy may be used to select the page template that you'd like to use. For example, you may want to retain all elements in your website template except the the sidebars. Under Classification, the user would click No Sidebars. Other potential categories you may use include: Secure, which indicates the Page will be behind the SSL, linking it as HTTPS or secure by SSL; or Blank Page Layout, which takes all other elements off of the page including the website's header. 5. Click Create. A yellow box will appear at the top of the Page Manager to indicate success. 6. After you create your page, edit the SEO. 7. Edit your Browser Title if desired and add a Meta Description. If you make changes, click Save. 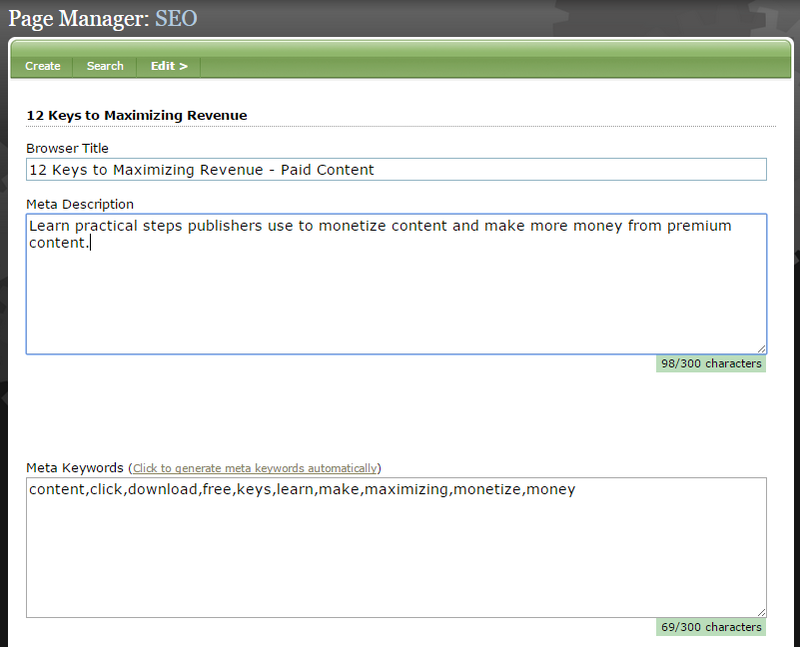 You may also edit the Meta Keywords for your page. 8. Return to the General section of the Page Manager Tool, and click the green Publish button next to Status. Zoom: Return to the General section of the Page Manager Tool, and click the green Publish button next to Status. Page Manager pages cannot be previewed like articles can. If you make changes after publishing your article, it may take several minutes for them to appear on your website. If you've made an accidental change that needs to be reversed immediately, contact your solutions manager. Prev: How do I limit/restrict the number of categories readers can select when purchasing or editing Directory Listings? Next: How do I create a unique URL for my landing page?